Many employers and employees are wondering what’s on the horizon for labor law with the new administration. While we’ve previously discussed how the administration might affect the National Labor Relations Board (NLRB) and several pro-labor rules issued during the last few years, there are other relevant appointments and changes that will have a tremendous impact on labor law. Perhaps most importantly, the president of the United States selects the Secretary of Labor. President Trump’s rumored selection for Secretary of Labor is Andy Puzder, CEO of various restaurant companies such as Carl’s Jr. While some have already voiced various concerns when it comes to Puzder, it is also important to remember that Trump’s other selections—such as the chair of the Equal Employment Opportunity Commission (EEOC), its commissioners, and its general counsel—will dramatically affect regulations impacting the workplace; however, all of these selections must be approved by the senate. Puzder is known to oppose increases in minimum wage pay; that being said, because a minimal increase from $7.25/hour to $9/hour would have a minimal impact on businesses, the federal minimum wage is projected to increase to the latter. 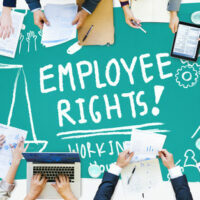 However, the Fair Labor Standards Act overtime regulations, which would have more than doubled the minimum salary basis for most exempt employees, will undoubtedly be eliminated. This stalled law would finally guarantee employment rights regardless of an individual’s gender identity or sexual orientation; rights that the courts are still split on when it comes to deciding whether they are already covered under Title VII. Given the administration’s reported perspectives on immigration, it is possible that the administration may force U.S. employers to use a program called E-verify, which looks into whether job applicants are eligible to work for U.S. companies. There has actually been some speculation that the Trump administration might support federally mandated paid family leave (where, as of now, there is only unpaid time off for certain individuals, as mandated by the Family Medical Leave Act). Employers currently face a high level of uncertainty when it comes to what will be put in place of the Affordable Care Act and how they will ensure compliance. The Office of Federal Contract Compliance Programs’ expanded regulations mandating pay transparency and certain disability-related requirements. Additional changes include the incorporation of cyber security laws relative to the workplace and public scrutiny surrounding any relocation of jobs outside of the U.S. If you are concerned about potential labor law violations, our attorneys can help. At the law office of Robert S. Norell, we are entirely focused on employment law, including all labor law violations, employment discrimination, unpaid wages, and related issues. We’ve been aggressively protecting workers’ rights for years. Contact us today to find out how we can help.